How Do I Add a New Install/Site? To get started, log in to your Admin Dashboard. Select “Sites” in the left navigation and click either of the “Add Site” buttons. The form for adding a new site includes a few options used to customize your site. Here is everything you need to know about them. You can select a physical location for each of your sites. This is where your data is actually stored and served from. We recommend choosing a location closest to your user base as this will decrease latency, TTFB, and load times. The name of the installation will be shown in the MyKinsta dashboard, it won’t be visible to your visitors. If you already have a domain you can select “custom domain” and it will use that when creating your WordPress site. 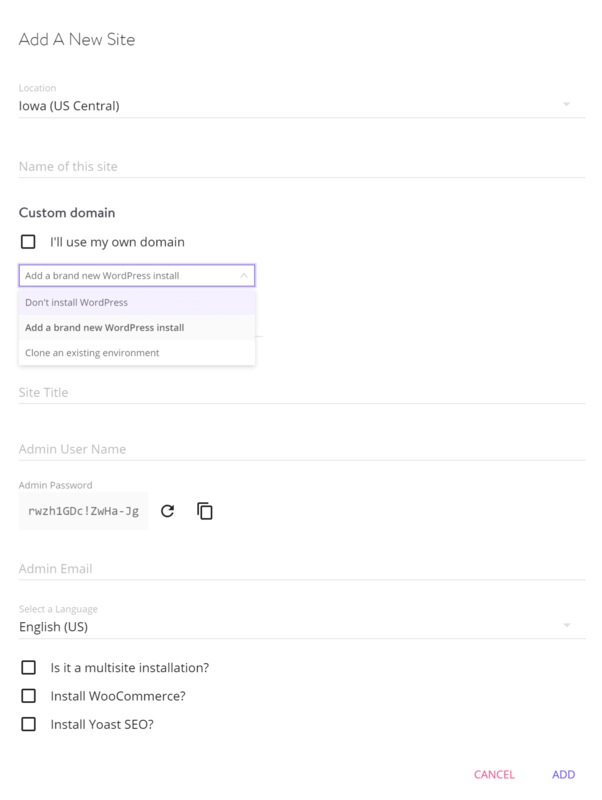 You can always add your custom domain after the fact in the MyKinsta dashboard. Important: If you use the custom domain option, a temporary domain will not be created. Should We Add A Brand New WordPress Install? Select “Add a Brand New Install” if you would like to add a new WordPress installation. In most cases, this is what you’ll want. If you are performing a manual migration of your WordPress site to Kinsta, typically the “Don’t Install WordPress” is what you want. 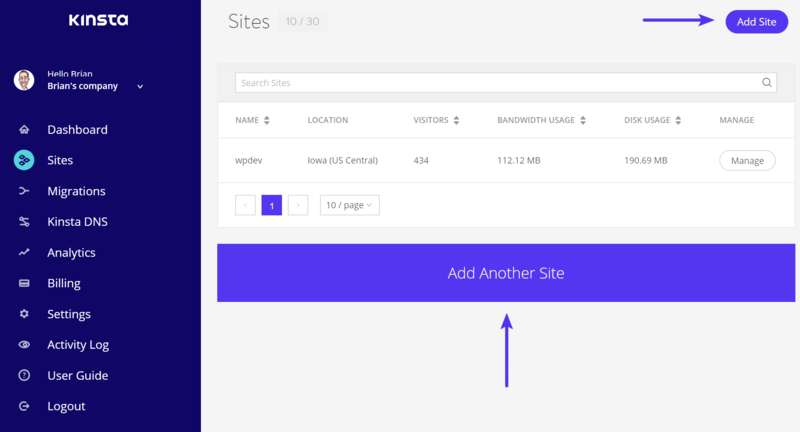 Check out our tutorial on how to migrate your site to Kinsta with the Duplicator plugin. You also have the option to can also clone an existing install. If you need a new installation, the site title allows you to set the title of your website. It will be visible to your visitors in a number of places including the browser tab and a number of other places depending on your theme. You will use this to log in to your WordPress installation. You will be able to add new users later on. We recommend choosing something other than “admin” for the username for maximum security. You will use this password to log in to your installation. We automatically enforce strong passwords to protect users. You can use the “generate new password” option if you want a new one. WordPress uses the admin email address to send important notifications. Select the language you would like to use WordPress in. 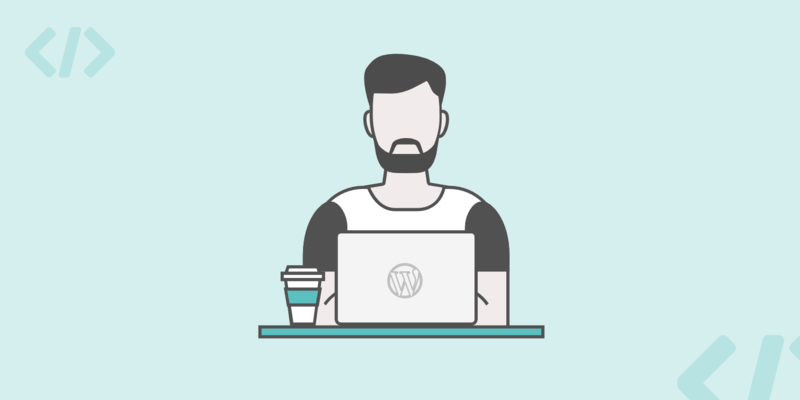 You don’t have to write content in the same language as your WordPress interface so feel free to choose your native tongue even if you are writing content in English. Tick this box if you would like to create a WordPress Multisite installation. Once selected you may choose between Subdomain and Subdirectory installs. If you are creating an ecommerce website WooCommerce is the most popular and best ecommerce plugin out there. Check this box to install it automatically. Yoast SEO is the most popular SEO plugin for WordPress, with over 3 million installs and a 5 out of 5-star rating. Check this box to install it automatically. When you’re ready, click on “Add” button. Creating the new site will take a few moments, you will receive a notification via the admin dashboard when it is ready.